The amazing folks at Squash Nutrition have been running the Food for Real Festival film festival in Liverpool for several years and it is one of the highlights in the Scouse foodie calendar. The festival brings the very local and the very foreign together in a the coolest of venues throughout the city. Showing inspiring and educational films from the deepest Peruvian jungle, the dry heart of Africa and the local heart of the Dingle it brings people together to explores issues around food and agriculture. Although nominally a film festival, it’s much more than that, with events packed with stalls of people selling food, sharing skills, and bringing life to the love of food in Liverpool. We were delighted that Squash asked us to come along on and run our own stall at the Make and Grow Food Market and Pop-Up Culinary Cinema that was held at Constellations on the Sunday. As the day was about making and growing food, we decided to demonstrate several small home aquaponics system that we’ve developed, that can be made from easily bought components (such as Ikea plastic recycling bins) and put together by anyone with basic DIY skills for under £50. 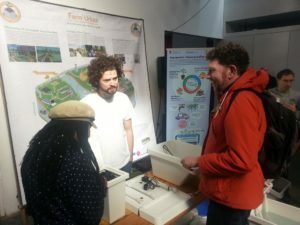 The systems are something we’ve developed for people interested in experimenting with aquaponics, but who don’t have the space or the money to dive in with a larger system. We’ll be posting the designs and instructions on our website for anyone interested in trying them out, so please get in touch if you fancy giving it a go yourself. The day was a really positive experience for us. We had a constant stream of visitors interested in learning about the systems and were hoarse by the end of it from talking almost non-stop for 6 hours (luckily there was lots of lovely food and drink to help keep us going). 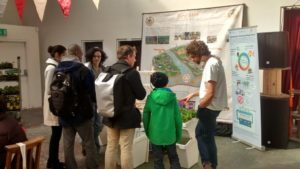 Aquaponics really seems to get people excited, so we had lots of people interested in volunteering with us, and also several groups around Liverpool who are doing exciting work around growing and are interested in working with us. It was also great to reconnect with the folks at Squash and to see how the Food For Real Festival is growing from strength to strength and how they are continuing to breath life into the food scene in Liverpool. We were really happy to be involved and we look forward to seeing how the festival develops in the years to come.